The practice of alchemy is the fictional ability to turn base metals into gold and it has occupied the minds of many people who probably should have known better in centuries gone past. 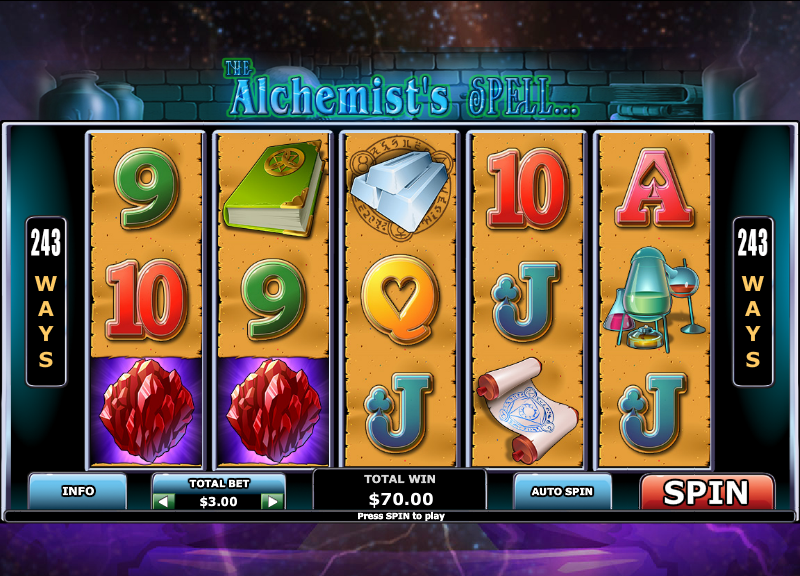 It’s also been the basis for one or two online slots we’ve reviewed in the past and now we have one more; it’s from Playtech via The Gaming Lab and it’s called The Alchemist’ Spell. 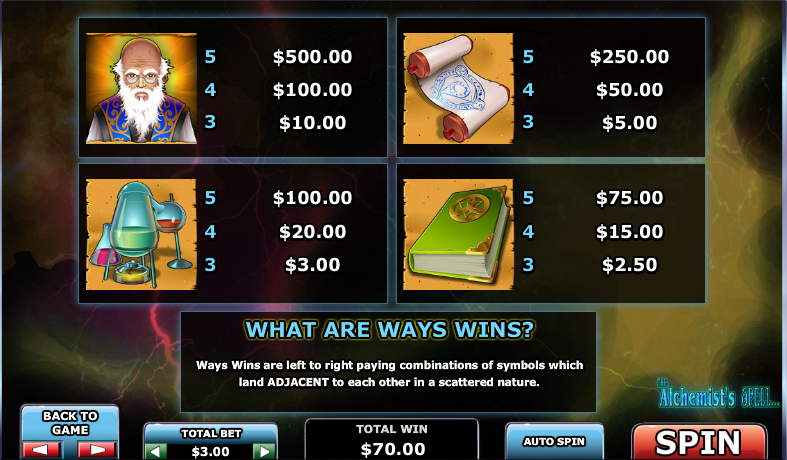 The Alchemist’s Spell is a five reel game with 243 ways to win; that means there is no standard payline structure and a win can be gained with matching symbols on adjacent reels from left to right. It all takes place in a gloomy lab where dusty books and jars occupy the top shelves. The main symbols are a green spell book, some bubbling chemicals, a seal on a scroll and the Alchemist himself. Lower value symbols are the standard 9, 10, J, Q, K and A. The big red crystal is the scatter symbols and there are three wilds – gold, silver and bronze bars. Landing three, four or five of the red crystal scatter symbols anywhere on the reels will kick this feature off. You will win ten, fifteen or twenty free spins respectively. During the free spins feature, the wild metal bars will add the following if they contribute to w winning payline. It’s also possible to land more than one wild in a winning combo and if this happens those wilds will be multiplied. All three wilds in now combo would therefore give you the maximum multiplier of 30x. There’s absolutely no player interactivity here so very little to offer in the way of advice. This is not a bad slot but it’s graphically quite basic and not exactly state of the art. It’s quite cheerful though so it’s probably worth a few minutes of your time.